The Canon EF 28-80mm f/3.5-5.6 II Lens is a very inexpensive normal zoom lens commonly included in Canon's film SLR kits. Some refer to the Canon EF 28-80mm f/3.5-5.6 II Lens as a starter lens. As long as the person using the 28-80 knows its optical shortcomings, that designation may be fine. Otherwise, they may permanently be turned off by the performance of their SLR or Digital SLR. The 28-80 features a low build quality. It is very light - in weight, in quality and in price. A plastic mount is utilized to aid in these light features. Compared to the other Canon econo zooms, this one does feel relatively tight. MM (Micro Motor) autofocus delivers mediums speed and medium level motor noise levels. The tiny MF (manual focus) ring is located on the extending part of the lens - The Canon EF 28-80mm f/3.5-5.6 II Lens extends/retracts on both zooming and focusing with 50mm being its shortest physical length. FTM (Full Time Manual) focus is not supported. The low end 5-blade aperture opens to a relatively slow aperture of f/3.5 on the wide end, going to f/4 at 35mm, to f/4.5 around 40mm, f/5 near 50mm, and to f/5.6 around 65mm. AV mode gave me 2 clicks for f/5 at 50mm. 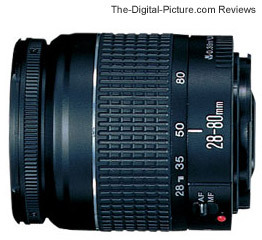 Focusing down to 1.25', the Canon EF 28-80mm f/3.5-5.6 II Lens provides decent magnification (.26x). The 28-80 is very soft wide open - especially at 80mm. Stopping down at least 1 f-stop is required to get reasonable sharpness. Corners are soft at 28mm. Even on a 1.3x FOVCF body, barrel distortion is obvious at 28mm until fading away at 40mm. Slight pincushion distortion is present from 60 to 80mm. Some vignetting is exhibited with the aperture wide open. Color and saturation are not wonderful. The 28-80 has a focal length range that falls within the normal, general purpose zoom range. 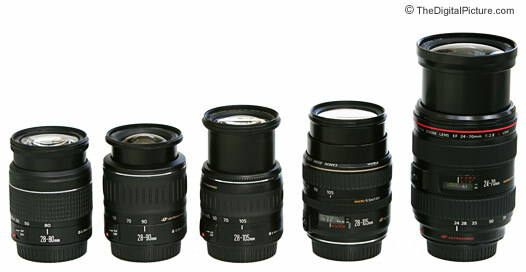 I recommend, if possible, purchasing one of the lenses suggested on the Canon General Purpose Lens Recommendations page.